River Narmada, also called Rewa, is the fifth largest river of the Indian subcontinent and the third largest in India with 130 kms after the Godavari and the Krishna. Originating from the peak of the Maikaal mountain and converging in the Arabian Sea at Gulf of Khanbat, Gujarat, its altitude from mean sea level is 3,500 feet. Also termed as the lifeline of Madhya Pradesh state in central India, its major tributaries are Hiran Tawa Ganjal, Goi Karzan, Tedone, Buarna, Kolar, Banjar, Maan, Uri, Orsang, Budhner, Sher, Small Tawa, Shakkar, Dudhi, Kundi, Veda and Sukta. It is also one of the three Indian rivers that runs from East to West and the longest west flowing river. The other two are Tapti and the Mahi. But the river is facing the threat of pollution with indiscriminate excavation of sand and minerals and water drawn from its tail; deforestation and open defecation on both banks, people throwing all sorts of waste like plastic and dead bodies. 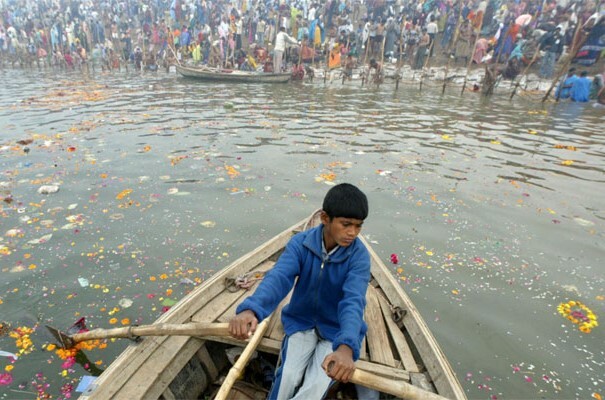 Is it going the way as the other two rivers, the sacred Ganga and the Yamuna? This is the question everybody is asking. 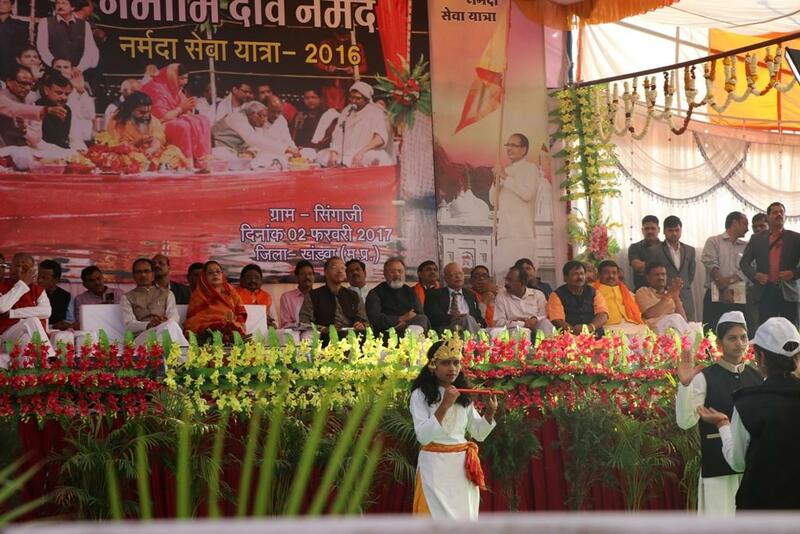 In order to prevent such a situation, Madhya Pradesh Government, headed by Chief Minister Shivraj Singh Chouhan, launched a Narmada Sewa Yatra (Save Narmada Rally) at Amarkantak from where it originates, amid chants of ‘Narmada Maiyya Ki Jai’ on 11 December 2016, to end on 11 May, 2017 covering more than 3,500 kms in 16 districts, at Sandwa. Of this, 1900 kms will be covered by foot. 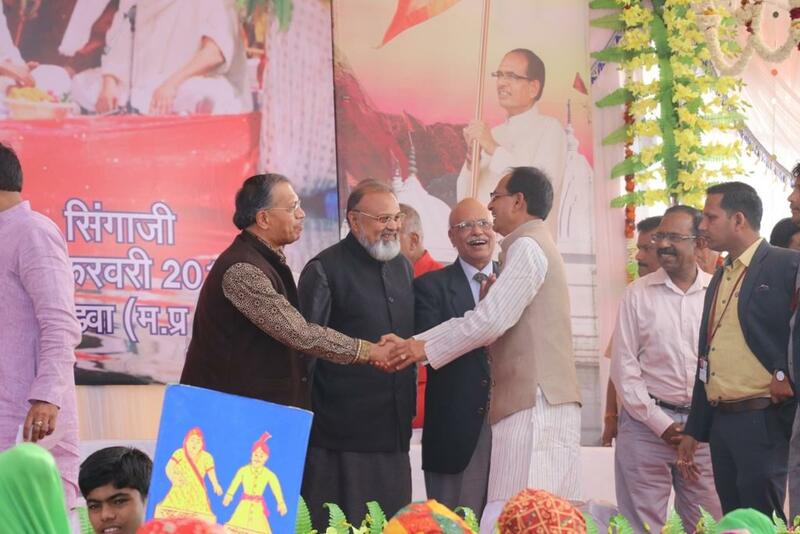 Madhya Pradesh Chief Minister Shivraj Singh Chouhan greets religious leaders Dr A K Merchant, Dr. Khwaja Ifthikhar Ahmed and Mr Premnath Arya. The five-month long yatra is aimed at creating awareness about conservation and making it pollution-free. To make the rally, the biggest public campaigns of the world of this kind, a success, Mr Chouhan has roped in religious leaders. As the yatra has social and scientific importance, workshops and public meetings are also being conducted. Mr Chouhan also joins the campaign every week. According to the Chief Minister, Narmada Sewa Samitis will be set up in all the villages for follow up action. Fruit-bearing trees will be planted along the river 1-km from the bank. Farmers have been assured a stipend of Rs 20,000 per hectare every year for the purpose for three years. In order to ensure that only treated water will flow into the river, he also announced setting up of a sewage treatment plant at Amarkantak costing Rs 15.50 crore. He hoped that at the end of the campaign, all villages will become defecation-free. A de-addiction drive too will be run in these villages. He advised youth and school children to blow the whistle if they found anybody defecating on the banks. 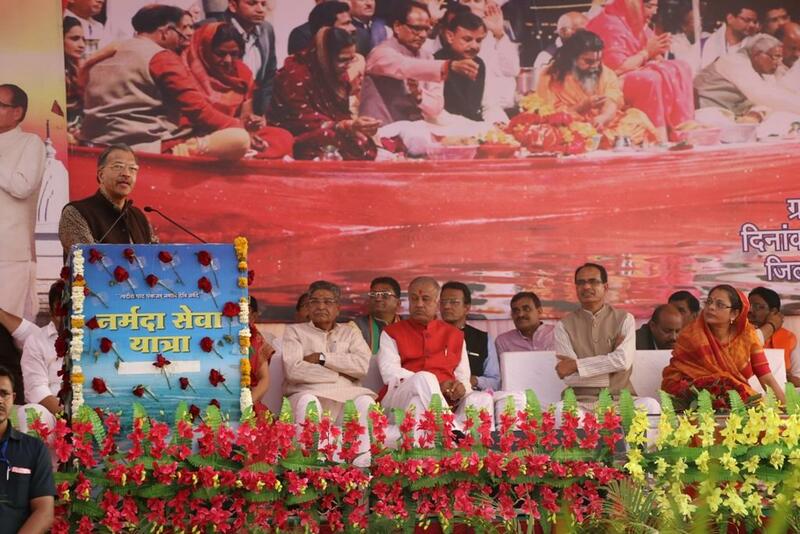 He said Narmada has blessed the state and its seven crore people abundantly. The river helped the state get four annual National Awards consecutively for producing maximum agriculture yield in the country. “Due to Maiyya (Mother Narmada) our growth rate was superb,” he said. This 118 days journey will pass through 282 villages/towns on southern bank and 275 villages/towns on northern bank. A control room consisting of 50 members will be formed at every district. “For a Muslim, washing with pure water removes the physical impurity caused by contact with the impure and restores him to the state of purity needed for prayer. For the Christian, baptism with water is the physical symbol of repentance. Likewise, there are many rituals of purification, through use of water in the Hindu tradition. Christians and Hindus make long journeys to bathe in the sacred Jordan and Ganga, Muslims carry water from the well Zamzam in Mecca,” said Merchant stressing the importance of clean water. Dr. Khwaja Ifthikhar Ahmed, President, Interfaith Harmony Foundation of India and Founder Trustee, Temple of Understanding India Foundation, also stressed the need to keep Narmada pollution free. Mr Premnath Arya, Advisor, Parkash Foundation also participated in the march. According to the World Bank, some 80 countries, with 40% of the world’s population are experiencing water shortages that threaten their agriculture, industry and health. Disputes between the states of Karnataka and Kerala over Kaveri water and between the states of Haryana and Delhi over Munak water are on-going issues in the country. Previous post What is a Man's Worth?